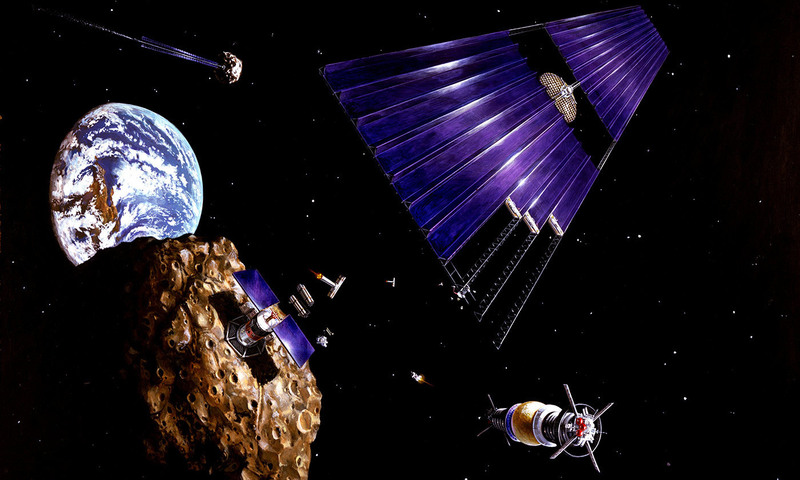 An asteroid-mining infrastructure could help to solve a major impending resource problem. This is exactly why platinum is not the objective of asteroid-mining. Instead, the first product from asteroids will be something much less obviously precious: water. To rocket scientists, water is the raw material for propellant. Launching water from Earth into space consumes a lot of propellant, which makes the whole concept self-defeating. Fortunately, water is abundant in space, where it is much easier to move around. Water can be readily extracted from clay minerals in a common class of small bodies known as carbonaceous asteroids. Once separated from the minerals, the water can then be split by electricity (a process called electrolysis) into hydrogen and oxygen to make rocket propellant – the key ingredients of rocket fuel. Using rocket propellant produced in space will reduce the cost of doing everything else in space, initiating a virtuous cycle for the off-Earth supply chain and transportation network. Before that can happen, though, we must find the customers who can get the whole process started. Who will buy rocket fuel made from asteroid water? One concept is to sell it to telecommunications companies for boosting satellites into orbit. A decade ago, most satellites were launched with a small upper-stage rocket attached. The rocket initially lofts the satellite into geostationary transfer orbit, a highly elliptical orbit having perigee (the low point) just a few hundred kilometres above the Earth’s surface, and apogee (the high point) about 36,000 kilometres higher. The spacecraft coasts to apogee, where the rocket fires and circularises the orbit so that the satellite can begin selling data to customers. The cost of the disposable upper-stage rocket is very high, however. Today, most satellite owners place a lightweight electric thruster on the spacecraft instead. Such thrusters are cheaper and more efficient, but very weak. It takes six to 12 months for satellites to reach final orbit. Time is money, so this delay still costs the satellite-owners hundreds of millions of dollars in lost revenues. Asteroid-mining will provide a third option. A mining company will sell water to an in-space transportation company, which will use it to refuel a space tug parked in Earth orbit. The tug will dock with the newly launched satellite in geostationary transfer orbit, and boost it to the final orbit quickly, within a day. According to our calculations, the total cost for this service, including capital recovery, finance charges, insurance and profit for all parties, will be less than the lost revenues of the current method, so that means there is a business case. The only concern is whether there are enough early customers to get the service established. Here is where the national space agencies like NASA can help. If they develop an in-space refuelling depot to lower their costs for exploring the Moon or Mars, and if they give out commercial contracts for some of this space water, they will lower the capital investment and risk for the new mining companies. In this way, government agencies can ensure the earlier success of private space industry. This is a legitimate role for government because taxpayers will greatly benefit. An asteroid-mining infrastructure could help to solve a major impending resource problem. Within a decade or two, the current system of satellites and fiber optics will not be able to keep up with the demand for wireless and internet data. I know of no solution apart from building antennas in space that are too large to launch on rockets, because nothing else scales up quickly enough to meet the data needs that will grow exponentially through to the end of the century. Metal from asteroids will not be sold on Earth, where it would be too expensive. It will remain in space, transmitting precious data down into the digital market. Similar arguments can be made that generating solar energy in space will, by sometime this century, be cheaper than generating energy on Earth through any known method. The energy might then be beamed to the ground via microwaves. Moving most of the energy sector into space will unburden the planet of the environmental impacts of energy generation, along with the entire supply chain that supports it. Even wind and solar disrupt large areas of land. Off-planet energy generation could eliminate one-quarter of the human industrial footprint by 2100, by some estimates. This does not even take into account the exponentially growing energy footprint of computer manufacturing and operation, which is terrifying from an environmental perspective. Note that none of these ideas involves bringing asteroid materials back for sale on Earth. The real value of space-based mining will be to create a space-based industry that benefits all of us. The primary import from space will be massless photons carrying data and energy. The important point our government leaders should understand is that investing in space-mining is a safe bet on our future, one of the safest they can make. NASA and the other space agencies will get more science and exploration, plus greater geopolitical presence, for less cost than their current way of doing business. Saving the Earth and improving our quality of life might simply be side effects we get for free.